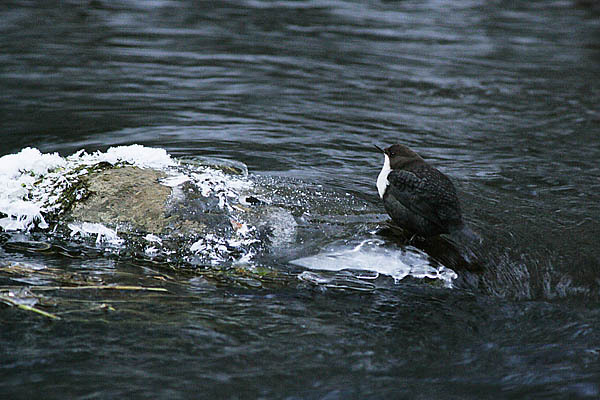 It already started to look as if dippers had made some secret pact and agreed not to show themselves to me. In a number of spots where they already have been seen this winter I didn’t find any. Last night it became clear that even at Taevaskoja where I missed out on it, it was nicely in place. But finally this morning at Alatskivi in Tartumaa I succeeded to see the dipper. It only flew past me a few times and disappeared into the road culvert under a bridge and did not appear any more. The dipper is the 94th specieson my year list. Lake Peipsi is still largely ice-free but there were no special waterfowl to see in the Nina-Varnja section. Only on Lahepera lake about a hundred mute swans were in place as before. In such numbers they are generally not seen inland in January. When I entered my latest observations into the e-Biodiversity data base it turned out that on January 12 the bird observations in it exceeded 100000. The creation of the bird observations database started in 2009 when the Estonian Ornithological Society and Estbirding decided to use the opportunities in the e-Biodiversity database developed at the University of Tartu and started to create a bird observations module. After much testing and adjustments it was opened for all nature friends at the end of April last year. The database is at http://elurikkus.ut.ee, in English at http://elurikkus.ut.ee/index.php?lang=eng and the bird observations module opens automatically from the Observations (Vaatlused) button at the top. The Estonian OrnithologicL Society, Estbirding and University of Tartu Natural History Museum invite all to become familiar with the data base and to use it actively. To enter your own observations you need to be registered as a user. Please send your application to info (at) elurikkus.ut.ee. More about the bird observations database in e-Elurikkus can be read in the birdwatcher information newsletter Tiirutaja nr. 13, p. 6 (in Estonian).